A Comprehensive Online Resource For Dining, Eating, Cooking and Snacking in Door County Wisconsin – Welcome! User Reviews & our Trusted Reviews – All in One Place! Enhance your Door County Dining experience! Comprehensive listings of Door County Wisconsin Restaurants, Door County Bakeries, Door County Wineries, Cafes, and Delis! 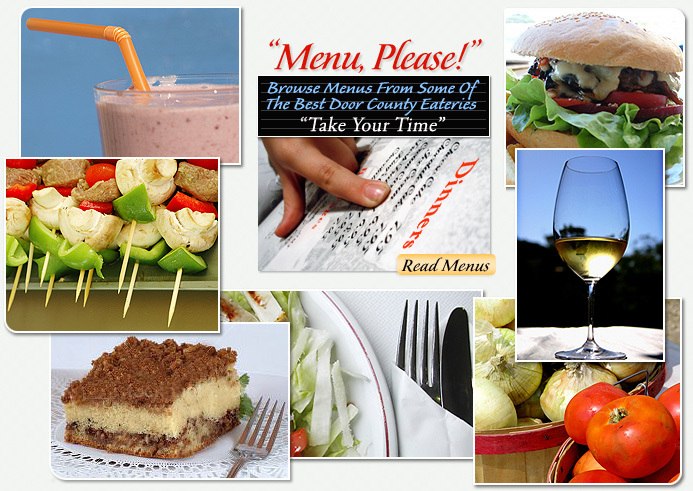 We provide links to menus from some of Door County’s best restaurants. You can do it right here on DoorCountyDining.com! You can even write your own review or click the stars to add your own star rating from one to five. 5 STARS is the BEST of course. Do it now and let us know what you think about your dining experiences in Door County. When you visit, you want to find Door County Restaurants that match what you are looking for and that will make your vacation stay even better! Casual Dining, Fine Dining, Cafes, Desserts,Fish Boils, special Breakfasts, Lunches and Dinners! On DoorCountyDining.com, and our sister site, DoorCountyNavigator.com, you will find everything you need including in-person reviews of Door County Restaurants and Dining establishments, Door County Lodging, Door County Real Estate, Door County Wisconsin articles, pictures, videos and things to do.. Enjoy Door County Dining !